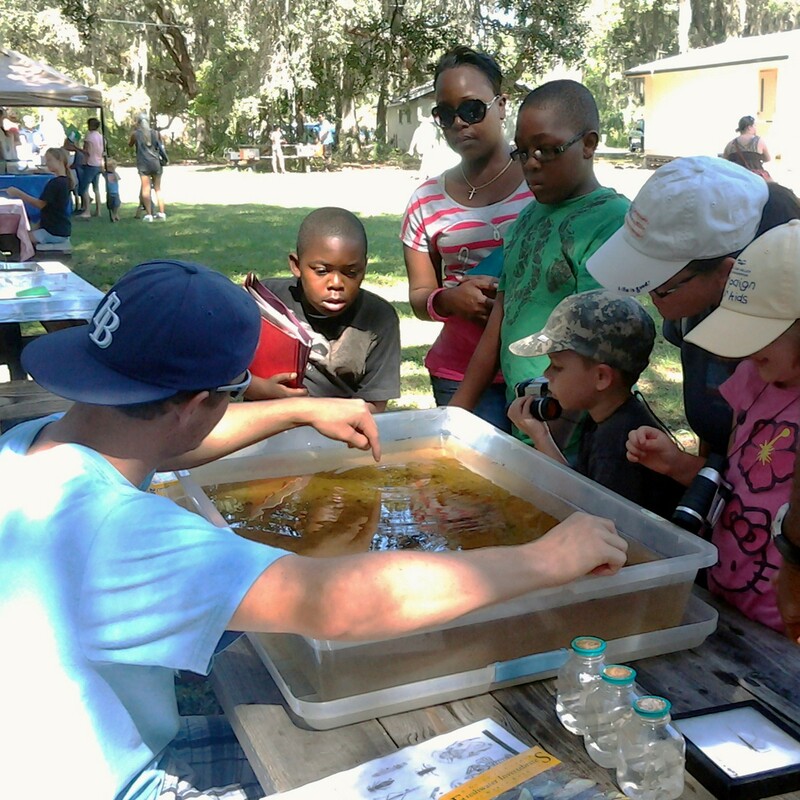 Parents and their kids line up to partake in assorted interactive activities at last year’s Back to School — Back-to-Nature event at Camp Bayou. Area schoolchildren will begin cracking the books Aug. 10 as Hillsborough County Schools starts its 2018-2019 school year. 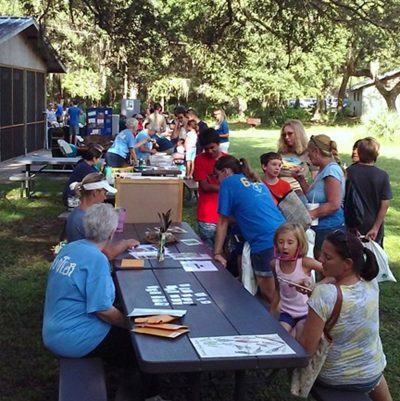 Before they do, Camp Bayou Outdoor Learning Center will offer them a chance to spend some time outdoors, learn about the local environment and collect some school supplies in the process. It’s time for Back to School — Back to Nature. Kids and their parents are invited to the four hour, 11th annual event, which will take place from 9 a.m. to noon Aug. 4 at the learning center, 4140 24th St. S.E., Ruskin. Admission and parking are free. Volunteers from Camp Bayou, The Florida Aquarium, Paleo Preserve Fossil Museum, Girl Scout Troop #30349, Florida Master Naturalist Program, Little Manatee River State Park, Tampa Electric’s Manatee Viewing Center, Environmental Protection Commission, Gulf Coast Research and Education Center, Suncoast Youth Conservation Center, Keep America Beautiful, League of Environmental Educators in Florida and possibly the Florida Forest Service will staff more than a dozen stations set up to provide information and hands-on activities for visitors. As families stop by these stations, kids will be invited to play interactive games or learn something fun about the environment. Once completed, they’ll be given a free school supply for participating, perhaps a spiral notebook, ruler, box of crayons, folder, set of index cards, pen, pencil or glue stick. Donations of school supplies or cash to purchase them for Back to School — Back to Nature are appreciated. You can drop them off at Camp Bayou on Thursday, Friday or Saturday between 9 a.m. and 2 p.m. or arrange for pick up by emailing campbayou@gmail.com. Advance registration for the event at www.campbayou.org is requested to help organizers know how many school supplies they’ll need. Back to School — Back to Nature will also include a raffle for larger items like backpacks, lunch bags, water bottles and tickets to The Florida Aquarium. And there will be a teacher-exchange table for educators to donate any unused resources and exchange them for resources they need. Goodie bags will be given to any teacher who identifies themselves that day. Kids can go netting for critters in the Little Manatee River at 10 a.m. or participate in a butterfly walk at 11. Camp Bayou’s walking trails, butterfly habitat, fossil pit and Native American campsite will be open. There is a small fee for kids to dig for fossils; otherwise, everything is free. 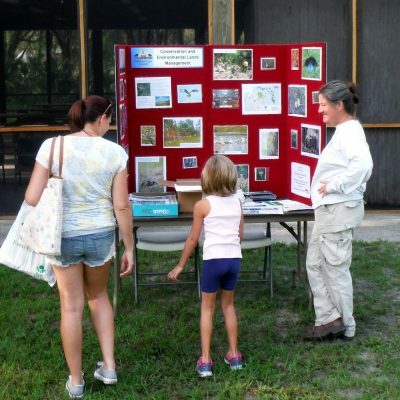 Camp Bayou Outdoor Learning Center is a public-private partnership between Bayou Outdoor Learning and Discovery, Inc. and Hillsborough County Conservations and Environmental Lands Management who owns this 160-acre ELAPP parcel in the public interest. The all-volunteer, nonprofit center is open 9 a.m. to 2 p.m. Thursday through Saturday for trail walking and activities like picnicking, canoeing or photographing birds and wildlife. Leashed dogs are permitted. For general information or to learn about volunteer opportunities at Camp Bayou, visit www.campbayou.org, email campbayou@gmail.com or call 813-641-8545. Back to School — Back to Nature will take place from 9 a.m. to noon at Camp Bayou Outdoor Learning Center, 4140 24th St. S.E., Ruskin. Informational booths like this one will be among more than a dozen vendor tables this year. 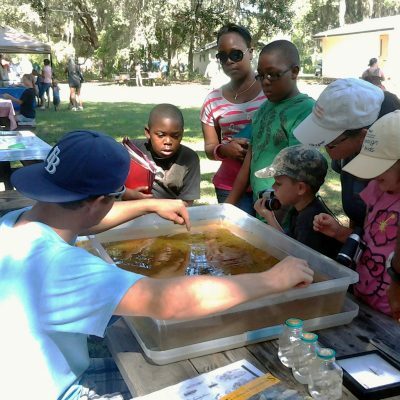 Kids are invited to experience hands-on, nature-related activities and collect free school supplies at Camp Bayou’s 11th annual Back to School — Back-to-Nature event Aug. 4.